One of the biggest sources of carbon emissions in the life-cycle of paper can come right at the start, when trees that will be used as fibre for paper are cut from forests or plantations growing on peatlands. Peaty soils are dense with carbon – globally there is even more carbon stored underground in peat than in all of the world’s forests – but when this soil is disturbed by logging equipment, ploughed for plantation establishment or drained with canals for timber extraction, the peat dries and rots, emitting carbon to the atmosphere. 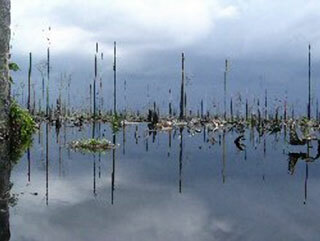 Trashed peatlands are therefore a significant cause of climate change. Some of the deepest peat soils in the world are in Indonesia, and the impacts of pulp and paper companies there, such as APP and APRIL, include the release of vast quantities of greenhouse gases. A study by Rainforest Action Network estimated that each tonne of paper produced by APP causes emissions of as much as 21 tonnes of carbon as a result of peatland decomposition. Keeping peat swamps wet and restoring peatlands after disturbance are major concerns of one of our most recent members, Wetlands International. We are proud to have Wetlands International involved in our campaign to protect Indonesian forests. You can read more about their work to protect and restore peatlands here.